A boy and dog are reunited in a very unusual way. Not great but good. The fact that they killed a puppy off in the first few minutes of the movie was a precursor of things to come. Too much animal abuse shown besides the water scene - leaving a puppy locked in a truck on a hot day, showing a puppy mill, chaining a dog outside with no shelter for years - emphasizes what goes on in real life for many dogs. Greta movie it has a real great meaning and it was emotional but was pretty fun to watch. Definitely watching it again! It was "good" - not great - not worth seeing in a theatre - definitely wait for DVD or rental / PPV etc. Cute movie, few emotional parts - dog lovers will shed some tears - no doubt. I loved this movie. Everything about it brought emotion. A great storyline and well acted. I will see this movie again. A real uplifting tear jerker. Great movie! It really makes you realize why dogs and their owners love each other so much. We would do anything for each other! I cried so many times, it was too much. It was an ok movie but I wouldn't see it again. Dog owners will love this movie if you see it as pure entertainment. There are tons of cute dogs and heart warming moments. Great for all ages and kids. Storyline is contrived but this is fiction. Everyone in the audience was laughing and left with a smile. Definitely a feel good movie. I couldn't understand why the dog had to die so many times just to get back to the original owner what about all the other owners? Loved it. Always loved my dog but appreciate him even more now! I cried 23 times and so did my bestfriend EVERYONE RATE IT 5 STARS! I'm now reading the book! Animal abuse is NEVER okay, the fact people are putting money in the pockets of the people who made this movie and encouraging them is disgusting. It's because I love animals that I would never see this movie. If you have and love dogs, this is a must see. Anyone that says this has anything to do with animal abuse has obviously not properly educated them self on the instances that they claim to be considered abuse or negligence. As for the film itself, we saw it today and it was truly a mesmerizingly beautiful, good hearted, and wonderful movie. The people who made it clearly love dogs as well as all their quirks and wonderful characteristics that dogs have that make them not only pets, but members of our families and often our closest friends. it was delightfully entertaining. Wife and I cried, laughed, reminded me of all the dogs That I've had in my life. Great date movie, great kids movie. Loved it even though i cried through half of it. I would see it again. No stars for animal abuse. Anybody with a heart for animals should boycott this excuse for a movie. 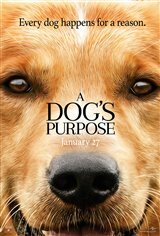 Very good movie.Put a tear in my eye when dog dies. Best dog movie since old yeller. I was skeptical about going to this movie as I'm not a particular dog lover but We both liked this movie a lot. A good story and didn't look at my watch once, which tells me it didn't sag. Just one thing ... I found the transition from one life to the next a little confusing at first, but to be honest I don't know how else they could have conveyed this. I can't believe how many people are rating this poorly based on animal abuse accusations - do you not watch the news?? They have already proven the video was pieced together by tmz and the movie producers have been cleared by outside agencies. Wow, at least get your facts straight before you accuse people of such a horrible crime. I hope you're never in the situation where people judge you without the facts. Being self-righteous doesn't automatically make you right. Absolutely loved it - great for everyone. Glad the animal cruelty accusations were shot down by that independent animal rights group. Shame on you tmz for splicing together a video and making it look like animal cruelty. Our group went to it-a few sceptical-a few-knowing the truth-no dogs were forced or hurt. None the less. AS A GROUP SOME WANTED TO RATE THIS ABOVE-DISNEYS CLASICS. AGES 16-69 IN GROUP[-OVERALL REVIEWS 5-8 STARS- a thrilling =eye-tearing-wonderful story with great actors-both human and 4 legged. Myself and a few others-going back to see it again this week. A great story. A must see movie for all dog lovers. A beautiful story about real life. It's refreshing to see a movie like that as there are far to few, they remind you what is most important in life, instead all those horror and action movies that promote violence. THIS WAS AS WONDERFUL & TOUCHING-AS ANY I HAVE SEEN. I SAW TEENAGERS WITH TEARS-AND MANY OTHERS FOLKS SITTING THEY WOULD CALL IT-ON THE EDGE OF THEIR SEAT WITH EMOTIONS & QUIET LAUGHTER & TEARS. Retired: but, still training & rehoming dogs! Good tear jerker. To all the nay sayers out there about animal cruelty....It was brought to you by PETA...enough said. Those yahoos lie through their teeth. They even faked the bit in the video with a guy saying throw him in. I loved this movie. I am a dog owner and can relate to the story. I recommend this movie but bring lot of tissues, you will need them. A great story of love and loss and love again. The dogs were wonderful, smart and charming. If you are a dog lover, you have to see this movie and read the books. i liked the fact that it was reincarnation in each episode. I will not watch this movie simply because I see the video of the animal abuse that took part in the making of this movie. f**king animal abuse. Anyone who rates this movie 5 stars after that needs help. Especially since the movie isn't that good to begin with. The 2 hour movie was well done but because so much was left out that was in the book, I was a little disappointed. But hey, you can only put so much in. I loved the cast and dogs that were chosen. Its a wonderful story. There are many, many dogs who LOVE the water. Using one of those would have been a better idea but even so, even as water lovers you can bet it doesn't include a swim in such turbulent waters! That dog was TERRIFIED!! And they forced a near drowning on it before it was brought out of the water. You can bet that this dog will have daily and nightly sleep terrors now for the rest of its life. You dam* movie makers should search to see if you even have a heart of your own before producing a movie intended to tweak the hearts of others for money. I'd love to see this movie taken right out of the market for consumer viewing. NO stars for this movie. Anyone who pays money to watch this movie is supporting animal abuse. To abuse and force terror on an animal for monetary gain or for ANY reason is deplorable. I for one, am boycotting this movie and hope many others will as well. A dog's only wish in life is to please their humans & to take advantage of this or return their love & loyalty with cruelty is deplorable and inexcusable.